Merrick Fresh Kisses are an innovative, natural dental treat designed not only to clean dogs’ teeth but to truly freshen breath at the same time. 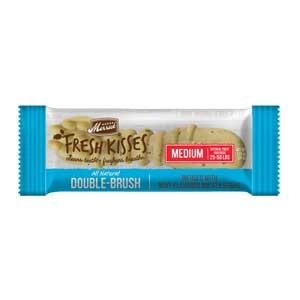 Merrick Fresh Kisses feature a double-brush design to clean teeth by removing plaque and tartar during the chewing of the treat. Fresh Kisses also are made with all natural ingredients specially formulated to freshen breath.